Dad's birthday added the Mickey Mouse collectors tin to the collection. 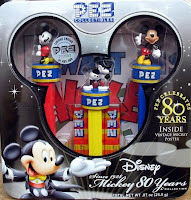 These are unique PEZ with full figure Mickeys from his different eras. A voluminous cache of new Valentine Heart PEZ sweetly send you love and best wishes. These are all new for 2008. Dream - To Jason, Stef & Paisley - the Dream little family making it in the big world on their own. (Hot pink heart & hot pink stem w/ white hearts and - new this year - white lettering. That's it gang - 8 new hearts to the collection. Not only are they all different we now have all 13 sayings. See Jan 4 Post for the rest of the Valentine Heart Family. There will also be a couple more college footballs this year - Virginia Tech and North Carolina - ughhh! no BYU yet. I guess this will be an almost infinite set... Like the pro-baseball set, (see above) which I am not sure the Cornwall Museum collectors will pursue. We have a baseball and a baseball is a baseball. Thanks to dreamlife90 who e-mailed this to me. Plus there have been other older or special editions added in 2007 some of which have not been displayed to the public yet.